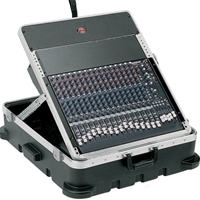 SKB 12U Pop-Up Mixer Roadcase SKB19-P12. The famous SKB pop-up mixer case for 12 unit rackmount mixers. New improved ratchet tilt-up system, unique angle-set feature lets you control the tilt of the board.